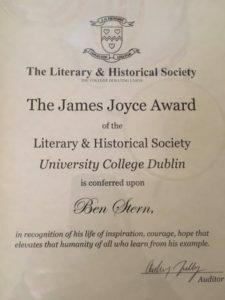 Ben Receives The James Joyce Award! Founded in 1855 by Cardinal John Henry Newman, the Literary and Historical Society, (L&H) is the oldest debating society in University College, Dublin. 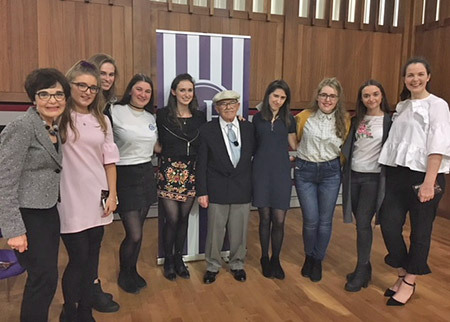 As one of the most prestigious and well-known student societies in Ireland, each year L&H selects recipients for it’s equally prestigious award – The James Joyce or (Honorary Fellowship of the Society). Recipients at the forefront of their fields are chosen for great achievements and outstanding success. For 163 years, respected academics, political figures, actors, writers, scientists, musicians and humanitarians have been added to this celebrated list. Past recipients include JK Rowling, Noam Chomsky, Emeli Sandé, Will Ferrell, Armando Iannucci and Archbishop Desmond Tutu. 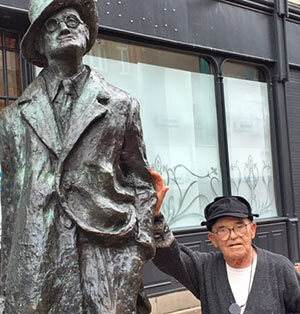 Near Normal Man creators were thrilled to announce that 97 year old Ben Stern was honored with the James Joyce Award in October of 2017! Charlene Stern flew with her father to Dublin and the following is Charlene’s account of their adventure. I love my father fiercely and am so very proud of the person he chooses to be in this world. This is my take on the journey to Dublin, Ireland to be honored and receive The James Joyce Award. When I received the Letter, it came through the official Near Normal Man’s website email. It was such a shock that I just didn’t believe it. So for two days, there it sat in my in-box. Finally I asked Vivian Kleiman, my creative producer for her professional wisdom. She wrote back: “Are you crazy? Respond! !” So I did. Next came telling my Dad. I said, “I received this letter and I want you to read it and then we’ll talk about it.” Then I handed him the letter from The Literary & Historical Society, nominating him for The James Joyce Award. His look of shock paralleled mine from three days before. Finally he declared that he couldn’t believe he was important enough to be honored. So I thought a moment and said: “Why don’t we go anyway?” Then he thought a moment, then accepted saying: “Well I could use a vacation.” So we decided to go! To ensure that Dad got enough rest on the flight to Dublin, we decided to take Business class which cost a large fortune. My film funds were basically depleted and I had no status on Aer Lingus for any upgrade (my United million miles meant “zero”). The Society helped pay a portion of the cost and two major “angels” helped with the rest. We took BART to SFO – hot and no air conditioning. In my mind check-in for Business class was going to be a quick, high-status pleasure. Nope. 5 -10 -15 minutes later, the check-in agent, then two supervisors, all failed to check-in my father – who had a brand new passport now good until 2025. Nervously I watched the clock while they made two calls to supervisors elsewhere. Hoping to speed up the process I tell them he’s getting The James Joyce Award and we have to make this flight. They were suitably impressed, but their system wasn’t. Finally 40 minutes later, they asked: “Would I like my father to be 10 or 20 years younger?” What’s the problem I asked? It turns out there aren’t enough “slots” in the program (across all airlines), so it “cuts” out all 95 year olds and older – thinking – “what 95 year olds are going to fly anyway”? I said just make him 10 years younger (20 years younger did feel a little weird). Then came the stowing of luggage in the overhead bins. Dad tried to take my bag and do it for me. I wrestled my bag back. Then I and another passenger tried to help him with his big duffle bag. Now feeling 86 years old, my Dad insisted on doing it himself, and all 5 feet of him put his bag overhead. We settled in. He had a great meal. I ate “Asian Vegetarian” because they don’t have a “vegan” option. I selected it thinking there’d be tofu or some soy protein product. Nope. It was veggies on a lot of white rice. Out came my almond stash and an apple I packed away. Then sleep (business class is really 1st class and the seats became flat beds – which is a great luxury). My Dad was so pleased with being able to listen to music; he relaxed and slept as well. And as a surprise gift for the occasion, the flight crew gave me a large bottle of Jamison Whiskey for my Dad! Then we landed, rested enough, and made it to the 2-bedroom apartment by cab. At the counter, the manager checked us in. I recognized her Polish accent and told my Dad. Instantly, he’s animated and talking in fluent Polish. She’s so delighted and laughing about what, I’m not sure, but they became instant relatives. This meant she wouldn’t take an extra 100 Euros as a security deposit for our stay. Nice. We walked around the City Centre taking in the people, shops and monuments. There’s a very thin and tall spire in metal at the very center of Dublin that rises way above all the buildings that are still delightfully short as city centers go. It became my navigation marker so we could explore easily by foot and find our way back, day and night. Next to the spire was a statue of James Joyce in bronze. We have a photo of Mr. Joyce with my Dad, of course. Thanks to Brian, my son-in-law, I had a map to the famous Temple Bar, which has a separate whiskey tasting room. Since bringing home a bottle of Irish whiskey was part of the fun of the trip, my Dad enjoyed the tastings and I enjoyed watching him taste and make the decision on which to buy. 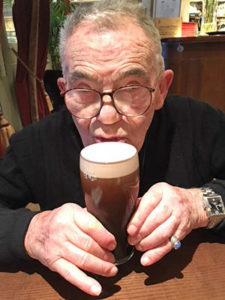 He splurged with Red Breast Irish Whisky – 12 years old and enjoyed thinking of sharing with many children, grandchildren and dear friends when he returned. During our walk to Temple Bar, once again I experience a lightning-bolt reminder of who my Dad is. At my urging and my Mom’s training, each of us packed a sandwich for the journey. I ate mine but Dad didn’t need his sandwich. On a grey and not to cold day, we explored the busy Dublin streets, looking to spot landmarks for our walk back, watching out for traffic and spaces where he could trip (eyesight challenged), and taking in our first impressions of the city. All off a sudden, Dad veers off to the left and speaks to a homeless man sitting against a building wall. Since we’re arm-in-arm, I’m pulled along with him. He asks the man; “Are you hungry?” The man says yes and my Dad pulls out of his carrying bag, his bagel and cheese sandwich and gives it to the man. They exchange wordless thanks and mutual appreciation. 10 seconds, 10 steps to the left and a lifeline of kindness – this is my father. 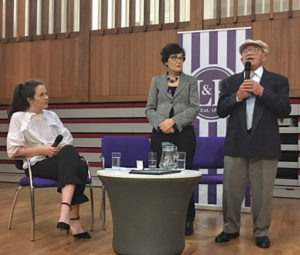 He doesn’t talk about it, but every day of his life since liberation, he’s aware of humanity around him and looks to help, sometimes with a dollar, some times to assist, but always a smile, a hello and often a small joke. That evening we walked again to a pub (to eat and watch my Dad enjoy his first pint of Guinness)! The next morning, we walked again, visiting the Trinity College library and marveled at its amazing beauty and it’s housing of a huge collection of ancient books. Seeing two gentlemen employees who were shelving some very old books, my Dad asks if he could “borrow one”? They immediately replied; “Yes”, “with permission”. We all laugh. Morning coffee in Ireland is great, but I couldn’t find Irish oatmeal, which is what I was really eager to have. Everyone was puzzled. Ok, I learned they call it porridge, but asking a restaurant if they have porridge on the menu is like going out to breakfast in America and asking if they have “Rice Krispies” on the menu. I did enjoy great Scottish smoked salmon on delicious bread as often as I could find it. So we were well fed and the friendliness of everyone made it a short, but fun adventure. That afternoon we readied ourselves for The James Joyce Award ceremony. Dressed up and ready, we met two of the Society’s officers for lunch at a stunningly beautiful former estate, now a Westin Hotel near the University College Dublin. We talked and learned the story of how the Society “found” my Dad and why they chose to honor him. The Society members were all struggling with a recently elected student body president (inducted last May, as a reasonable candidate). Soon after her appointment, her rhetoric turned to hate speech against minorities and immigrants. This had created great discomfort, embarrassment, stress and debate on what to do, among the students. The most egregious step she took was to censor out of the student handbook, all information female students need to make a decision on whether and how to have an abortion. While abortions are illegal in Ireland; information isn’t, and women travel to Britain to have them. Now, I understood why they were especially eager to hear my Dad speak and ask burning questions. Strategically the same day of his honor was also the day for the student referendum on whether to impeach and remove the body president from office. The conversation at lunch veered to the U.S. and our troubles, which are causing worry and concern about America as the world’s leader in values and democracy. The actual event is mostly a blur. I’m so grateful that Beth, my youngest daughter, happened to be in London and Dublin for work, and attended the big event. She and her grandfather got to relax for ½ hour while I watched multiple student techies unsuccessfully try to load a DVD of Near Normal Man I brought, but it wouldn’t work – not even on a Macbook). In the end, we used the link and password. While we had some glitches during the screening, which mortified me, the student body didn’t move nor text, not once, during those brief pauses while the Internet hiccupped. We sat on stage together, with an officer of The Literary & Historical Society who acted as moderator. She welcomed us onto the stage when everyone had been seated. It was a full auditorium with standing room only in the balcony. I introduced “Near Normal Man” and then my father. He spoke for about 15 minutes and then we took questions. The first question was: “Mr. Stern, what is your reaction and response to Charlottesville?” All of their questions were thoughtful and sometimes profound, about what it means to be human today and face the pain of our planet and our humanity, along with, the rise of anger, hatred and rage we are witnessing in America and around the world. Questions came about my Dad’s experience and his feelings about what it taught him. And, questions were asked about God and about how to respond to hate speech when we hear it. Then, came the ceremony. 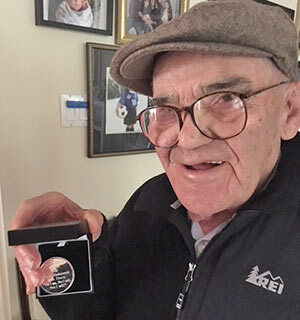 My Dad stood at centerstage, the Officer presented him with, the Certificate, the Medal and then welcomed him with words that made him an honorary member in The Literary & Historical Society. There was a standing ovation for the two of us. My daughter Beth treated Dad and I to a delicious dinner celebration, with wonderful conversation, smiles and laughter that night. Her presence represented the family my Dad and Mom created and built – 3 children, 7 grandchildren and 5 great-grandchildren. Beth added the special joy Dad feels when he’s with his family. So how did they find my Dad? One of The Society’s officers, Sadhbh McCarrick, traveled to Amsterdam for a weekend holiday and tour of the Ann Frank House. At the end of the tour, the group watched a video of current events relevant to issues of tolerance. She saw “Ben Stern” on one video clip, looked him up when she returned to Ireland, and then she nominated him to the rest of the Society. 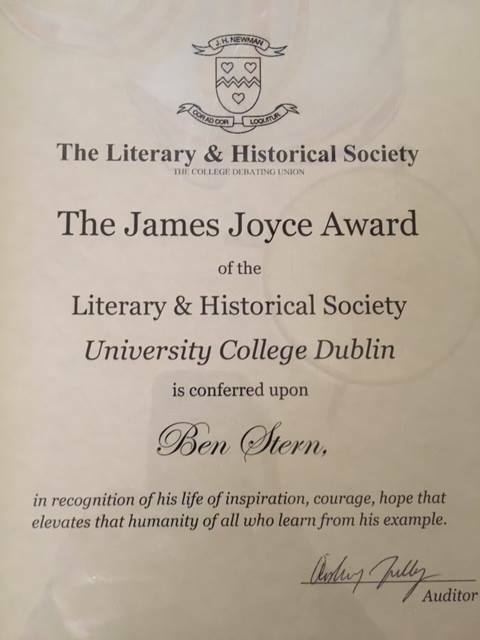 The Society voted to confer The James Joyce Award to him. I received the email letter, got through the shock of it, and we ventured on this amazing and immensely enjoyable journey to wonderful Dublin, Ireland, the University College Dublin and with The Literary & Historical Society! I insisted on buying my Dad a brown wool tweed cap for the winter. It has a small, embroidered Celtic design on the front. Medal, Certificate, Irish whiskey, a cap he’s enjoying and me, with a lifetime memory of being with my “near normal” Dad through this extraordinary event – fills me with hope with and for humanity, and all worthy work and kindness we do and witness in our world and in our lifetime. 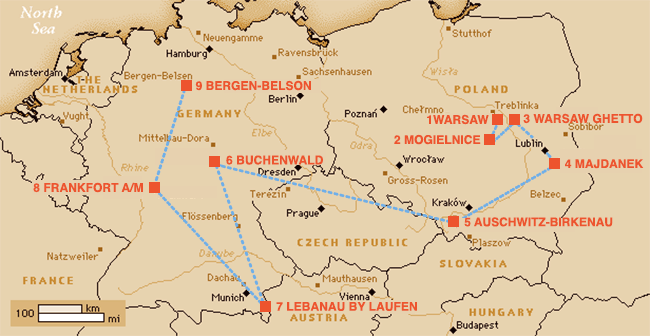 WATCH Ben Stern is a 95-year-old Holocaust survivor. Here’s his advice for protesting neo-Nazism.